Here's a simple, but a creative idea for seating on your patio. 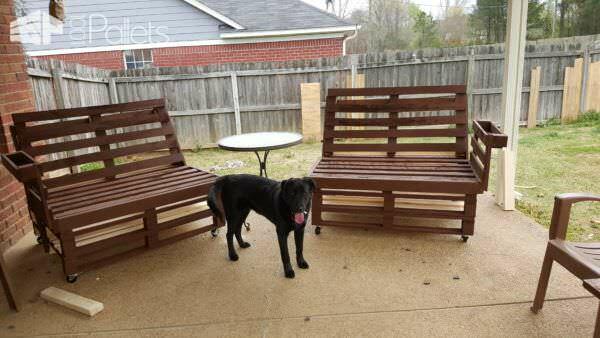 Make a set of these Pallet Loungers! 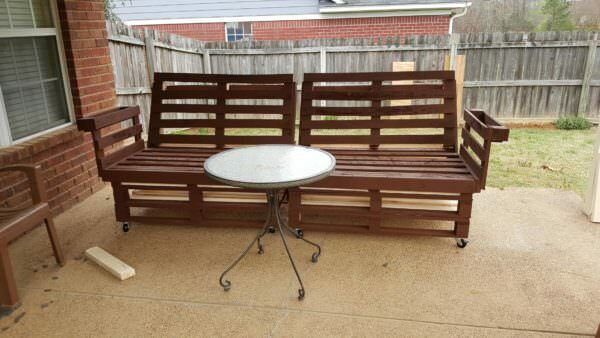 I used pallets to make my patio furniture because they're budget-friendly, and I needed some seating! This project only took me two hours to complete, but the painting took a while - I wanted it just right. First, I stacked two pallets on top of one another and secured them together with screws. I put a third, larger pallet on top of the first set and secured it down. I mounted another pallet to the back of the couch and secured it well for the backrest. I angled the backrests slightly because that is a lot more comfortable than having a very rigid 90-degree angle. I took my time painting the loungers. I painted everywhere; top, bottom, undersides, cracks and crevices - and "encapsulated" them. I did a couple of coats to thoroughly protect them from the weather. When they were dry, I installed four casters under each lounge section - with locking mechanisms, so I can have them stable if needed. This was a fast and fun project. Again, the longest part was . . . "watching the paint dry".